Around the Fourth of July you can’t have too much red, white, and blue. And when it comes to 4th of July decorations and making a wonderful patriotic wreath is the perfect project to begin with. 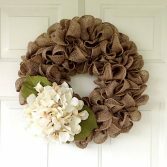 The wreath can beautify your festive entrance or your interiors. 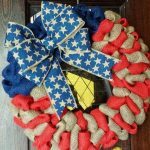 The best part of this wreath is that it is fairly easy to make and what’s even better is that you can use your most favorite patriotic symbols to enhance its looks. Make it rustic and vintage or go for a more modern look by using vibrant colors, it’s all up to your individual gusto. 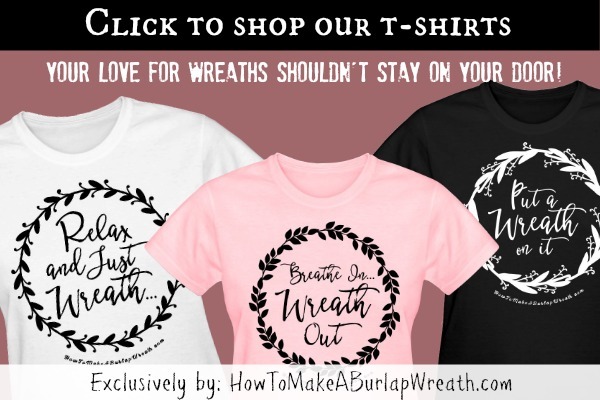 So don’t waste any more time, gather the necessary supplies and follow the few steps needed to have you very own, special 4th of July Decorations Wreath. Bring a patriotic touch with an American flag. You can use this video as a guide, but feel free to add your own patriotic decorations, flag, and embellishments to make it custom to your liking! You can find the link to the video on how to make a 4th of July Decorations Wreath here. Arrange your chosen items until you are satisfied with the outcome. Secure each item with some hot glue or wire to the chosen spot, starting from the base layer. Use a wreath hanger or craft a hanger by making a loop out of the ribbon for hanging. Patriotic 4th of July flowers, greenery and ribbon make this wreath! Other creative Americana decor ideas. 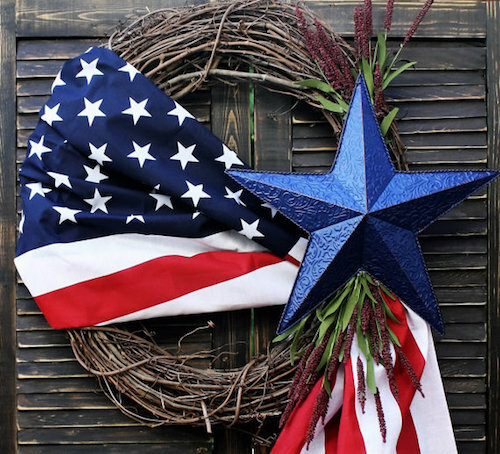 Other than the obvious items like flags, think about using some unexpected items for your Americana décor, like blue, red and white flowers, decorative stars or burlap ribbon with patriotic designs and colors on them. 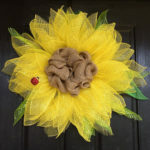 Finding inspiration for making summer wreaths is really easy, since there are so many things that can represent the hot season. 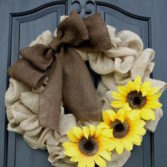 Anything that reminds us of sun, blue sky, beach and vacations can be used to make the perfect summer wreath. Making a 4th of July Decorations Wreath is all about showing our great feelings of proudness. Use items that are worthy and capable of embodying these feelings. Use some special flags, rustic stars or perhaps vibrant flowers to do exactly that. For a stunning effect, try to spray paint the grapevine wreath before you add the embellishments, using a patriotic color. Don’t hesitate to make this wreath, since it’s a wonderful way to show your love and appreciation on this meaningful day of celebration. 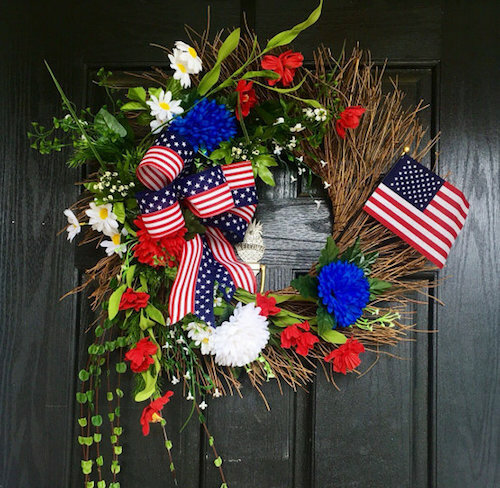 And if you are invited to celebrate this day at another house, this patriotic wreath would make for a unique gift that will be appreciated and cherished for many years to come. 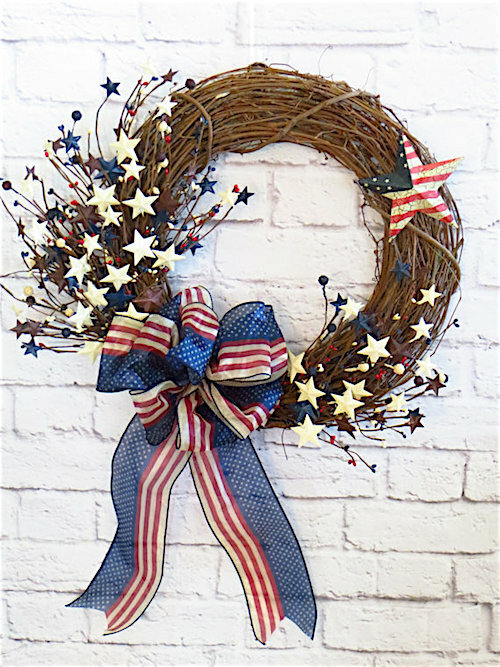 For more patriotic wreath ideas for summer holidays visit our patriotic wreaths category. Such cute ideas!!! Thanks for sharing!!! Thank you for sharing with us at Merry Monday. I hope you have a lovely holiday weekend. What a great wreath. I saw this on Work it Wednesday. Thanks for sharing it! 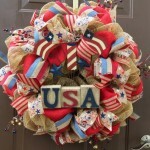 Great patriotic wreaths! My favorite is the one with the flag swagger across on the diagonal and the big, blue star. 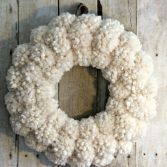 But, really, all of these wreaths are super-cute for the season. 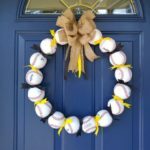 I love these types of wreaths. I’ve seen a few around my neighborhood, but this is a new twist I like much better!